The Pedal Power Utility Box makes team efforts possible! Up to 10 people at once can convert their good clean Pedal Power to usable AC power, for devices rated up to 1000W. A Pedal Power Utility Box in use at an event. All the essential circuitry and wiring needed for Pedal Powered events is safely beneath a polycarbonate panel, so wires don’t get yanked. 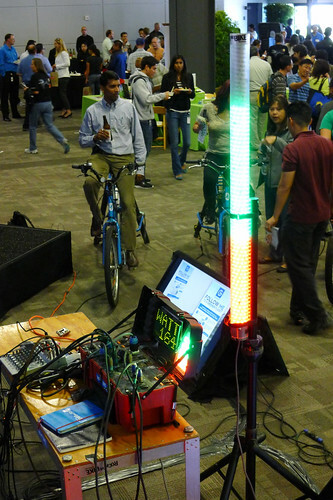 A four-line LED ‘Pedalometer’ displays current power levels to pedalers, so they can adjust their effort to keep power ‘in the green’. Dealing with wiring, protection circuitry, and power display is often the most challenging part of planning and building a Pedal Powered Stage. Why not let the pros handle it? 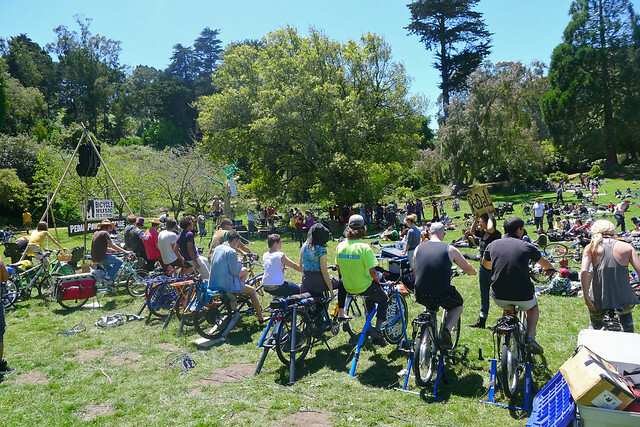 Rock the Bike has been building Pedal Power gear and wiring up bike music systems since 2003. The Pedal Power Utility Box has an ultracapacitor that stabilizes the spiky DC power coming from bicycle generators and makes it useable and stable power for lighting, music, projectors, and other devices to run dependably for hours at your events. Plug in anything short of a hair dryer or electric kettle into its standard 110V or 220V AC outlets. The integrated Pure Sine wave inverter provides up to 1000W of continuous AC power. Higher total power levels are possible when you use our Modified JBL PRX loudspeakers, or use the DC output ports, as these bypass the AC inverter. Continuous pedaling is needed to keep devices on. There is no battery, only an ultracapacitor lasting a few minutes. Above: The Pedal Powered Utility Box can include an output for a 4′ tall Pedalometer, which is visible to more pedalers and to your audience. The Pedal Powered Utility Box shown above also features a Wattage Display, which is now available as an upgrade. — Ultracapacitor provides a 2 – 5 minute buffer of power (depending on consumption levels). — 1000-watt Pure Sine Wave inverter with two outlets. Use a power strip to run more devices at once. — Durable Neutrik twist-lock connectors — the gold standard in the event audio world. Yanked cables don’t disconnect. Status: built to order, please allow 3 weeks for the build. Event deadline? We can do rush delivery with extra charge. 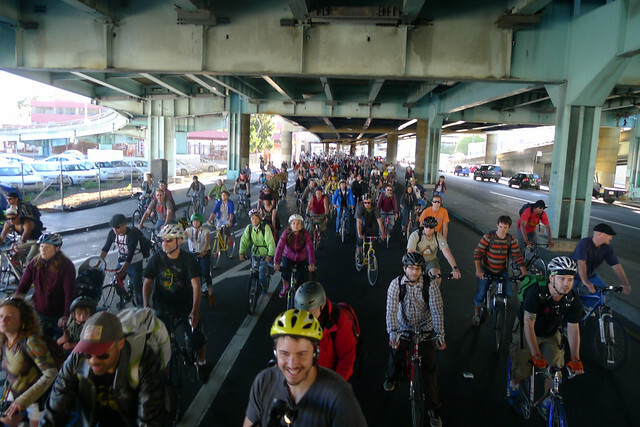 When a bike gets stolen, activate your networks to get lots of eyes looking for you. And then get that bike back. After a recent Bicycle Music Festival volunteer meeting one of our best cargo bikes, a Mundo 500, was stolen. It was locked to itself. This electric cargo bike was heavy, immobilized and impossible to push. The thieves must have had to lift it into a truck. I realized it the next morning and felt dejected and ashamed. I gathered some resolve to ask around for my bike. I remembered my friend Kipchoge’s story of recovering his stolen laptop by spending 3 days lurking in the underworld of San Francisco’s seediest Tenderloin and Mission neighborhoods. When he finally found himself face to face with the man who’d stolen it, in the hallway of a dingy hotel, the man admitted he hadn’t yet wiped the hard drive or sold it yet because he liked a video on the desktop. The video showed Kipchoge and his friends riding into the woods on Xtracycles carrying chainsaws, in order to do trail maintenance. I printed out the photo below and headed out to talk to people in the nooks and crannies under highway overpasses and in the Plaza at Civic Center. I also reached out to crewmembers and friends on facebook for help. I posted it everywhere, in all the group pages for which I was a member. RTB’s Nio connected me with Jenny Oh, who has built a bike theft recovery network that is remarkably effective at getting stolen bikes back to their owners. She reposted my photo and shared her tips for getting bikes back. Following the advice I filed an online Police Report.